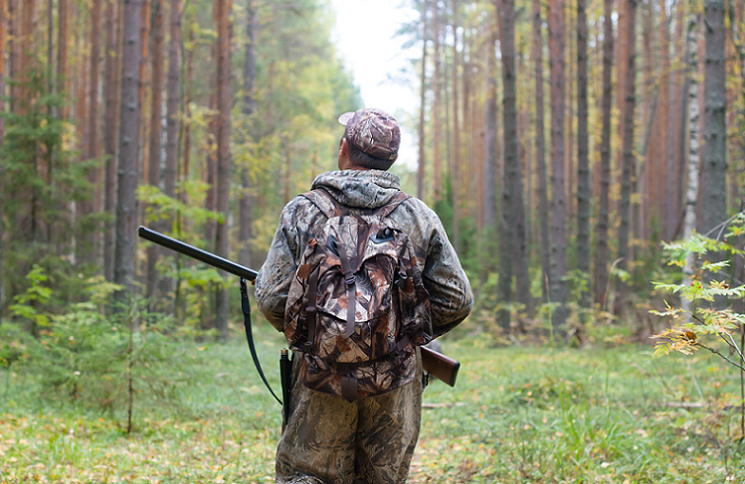 Are you wondering how to find the best hunting backpack? I guess you do. It is normal to be confused, especially if you have a lot to choose from. 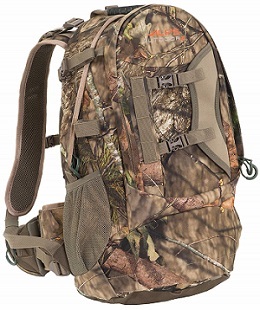 Backpacks for hunting differ widely in terms of sizes, design and construction quality. This convenient gear may not be a must for a hunting trip, but it can make your hunting easy. A reliable and robust backpack will make hunting even the biggest of legally hunted games a breeze. Such a pack must be capacious to handle the enormous loads of meat following a successful hunt. However, it must be nimble and light enough for use on a hunting trip. Maybe your interest is not on hunting big games. Better still, there are hundreds or even thousands of packs that will fit your needs. You only need to know to look for. I have sussed out what the best packs are after speaking with hunters and testing various models currently in the market. 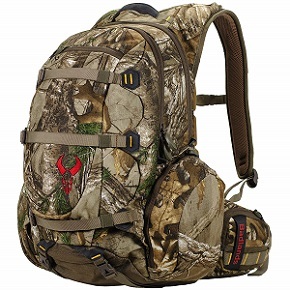 In this article, I present to you top 10 best hunting backpack. At the bottom end of this resource, you will get an in-depth guide on what to look for when shopping for the best pack for your specific needs. Life as a hunter cannot be any better with the ALPS OutdoorZ Pursuit. This backpack is affordable, yet it is packed with several performance-oriented features. Its unique design is an appealing feature to most hunters and archers in general. ALPS designed this pack with the capability to hold almost any arrow and gun. The interior of the bag consists of several spaces that together provide up to 2700 cubic inches of storage space. You can pack almost everything you need for a night of hunting. There is a unique front organization shelf pocket to put all your essential gear at your fingers’ reach. You can keep your essential items at your fingertips with the innovative drop-down bow/rifle holder pocket. There is also a quiver holder as well as hydration port and pocket. A padded waist belt featuring two pockets and a reinforced webbing accommodate the standard clip-style holders. 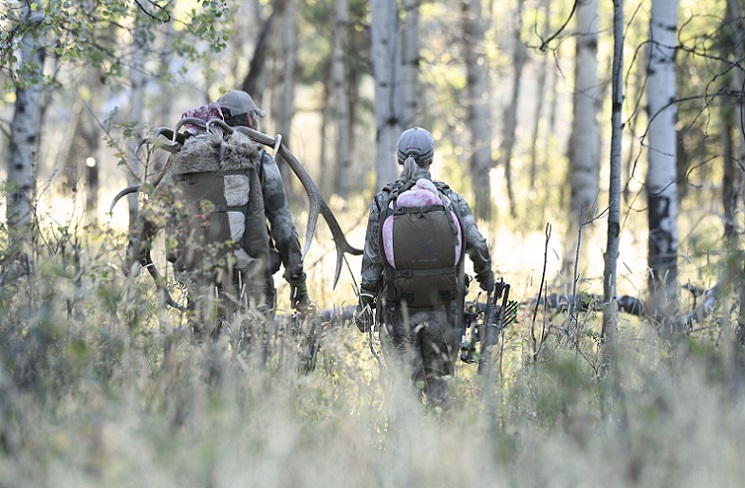 A good quality hunting backpack should have a way of resisting moisture. The Pursuit from ALPS OutdoorZ provides for this via its blaze orange rain cover. You can be sure the cover will keep your hunting gear dry during extremely dry conditions. The Pursuit backpack comes in a variety of pattern to suit your needs. For instance, the brushed mossy oak break-up country design of camouflage pattern makes it a breeze for you to blend in a woody environment for a great hunting experience. It is also among the most affordable yet high-quality models in the market. If you want the best hunting backpack under 100 dollars, then the REEBOW GEAR Military Tactical Backpack should suffice. Measuring 13 inches by 20 inches 11 inches and a capacity of 40 liters, this tactical pack will comfortably accommodate your most crucial hunting items. 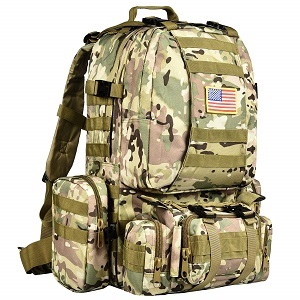 This military backpack is constructed from a high-density (600 x 600) fabric that is water resistant and durable. 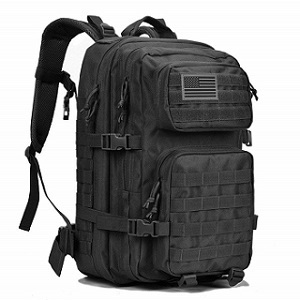 The unique feature of this carrier is the molle system which consists of molle webbing throughout to allow you to attach additional tactical pouches, pockets or gear as 3-day hunting bug out bag. Zippers are heavy duty and double stitched for durability, and feature utility style cord pulls for easy access. Load compression systems on the front and sides of the backpack diminish the size of the back for easy handling. The back area and shoulder straps of the bag are padded with a ventilated mesh to improve breathability and comfort. 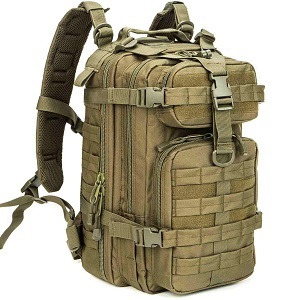 Another great feature setting the military tactical pack apart is its hydration compatibility although the hydration bladder is not included. Just add a hydration bladder so that you can effortlessly quench thirst even as you hunt. This backpack is not only suitable for your hunting trips. The versatility of the molle webbing system means you can use the pack as a 3-day assault backpack, bug out bag, survival pack, range pack, trekking backpack, military backpack or a day pack for your everyday needs. The Commander backpack from ALPS OutdoorZ is excellent for elk hunters because of its massive capacity and dependable design. It provides a whopping 5250 cubic inches of organization space. This means you can carry an enormous load of meat after a successful hunt. Furthermore, you can pack all the necessary hunting gear and still have enough space for a hydration system. Let us consider the frame first. Commander freighter frame is made of lightweight aluminum. You can adjust the structure to fit your torso and height preference. This is great because only a few hunting backpacks are adjustable for torso length. Such adjustment is incredibly easy to make. All you need to do is to remove the retaining pins. This gives the torso a range of length from 17 inches to 23 inches. Interestingly, you can purchase the frame separately from the pack bag. Commander frame features three pockets for a knife, a flashlight, and a shooting stick. To improve breathability, the structure has a mesh back band. You can hike for hours without sweating or feeling uncomfortable. The hip belt of the frame has two handy pockets for protein bars or binoculars. The inner aspect of the pack bag features a middle divider which runs from the top. The divider is excellent if you wish to keep some items positioned at the top. There is also a bottom zipper for entry into the lower compartment for further organization. A rifle holder is capable of organizing any rifle. Loads of pockets stud the pack bag for unbeatable organization. 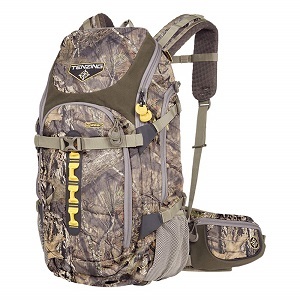 The Badlands Camouflage Hunting Pack is excellent for hunting and hauling meat after a kill. It is made from KXO-32 fabric which is known for durability and resistance to elements. The fabric is DWR-treated to offer cent suppression and resist dirt, moisture, and blood. This level of camouflage will guarantee you success in most of your hunting endeavors. It covers all the bases with its built-in meat-shelf, tripod pockets, and an internal scope. 2200 also features zippered back entry panel to give you quick access to your gear. The pack is incredibly comfortable to carry thanks to Badland’s ThermoMold suspension technology. This advanced technology uses molded foam that is ergonomically designed to match every shape of the human body. The internal frame and straps for load lifting feature the T-6 aircraft aluminum construction to remain durable and lightweight. The frame is also designed to transfer weight to your hips to minimize fatigue. An integrated rifle booth, as well as a built-in hip-belt pistol holder, improves the versatility of the pack. Even better, there are compression straps to offer you numerous options when it comes to gear attachment. 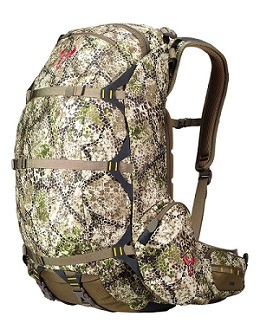 The 2200 Camouflage is compatible with two-liter hydration systems and even Badland’s bow boot. What I prefer most about this pack is its stealthy design. It features a neutral color palette that enables the approach technique to mingle with your surrounding and the general lighting. It will blend uniformly with a broad array of hunting environments. CVLIFE Outdoor 60L built-up tactical pack is a must-have if you are interested in outdoor activities. The feature that sets this backpack aside is its detachable design. It comes as one main bag but with three removable molle pouches attached to the two side and front aspects. The front detachable is ideal for use as a tactical fanny pack separately. The molle pouches on the two sides are great for organizing accessories such as First Aid Kit. It would not be wrong if you were to regard the CVLIFE as a 50-liter and a 60-liter backpack. 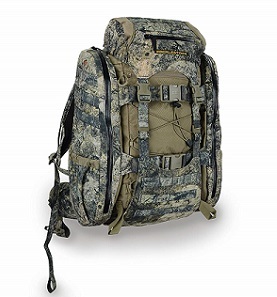 Such enormous capacity makes this tactical pack suitable for big game hunting. This high capacity hunting bag is constructed from strong and water-resistant 600×600 fabric. The lovely features are the adjustable double density ventilated mesh (breathable) shoulder straps, heavy-duty zippers, dual compression straps, cinching waist strap and rain-diverting flaps. These attributes make your pack secure and comfortable. You can use this high-capacity versatile backpack as a hunting pack, a 72-hour emergency kit, range bag, a bug out bag, an army camouflage backpack, a rucksack, a hiking trekking backpack, camping pack, 3-day assault pack, and an EDC outdoor kit. Imagine getting such a fantastic hunting item for such affordable prices. I believe the Tenzing 2220 Daypack will impress you the moment you get an opportunity to use it. From overall design, color pattern and construction material, this backpack belongs to a class of its own. The straps are stable, easy to use and manipulate. Each of the straps is ideally engineered while the construction material is impervious to the relentless and sharp mountains including the ones in Pacific Northwest. Tenzing 2220 daypack features amazing craftsmanship to ensure there is nice access to all compartments and pockets. The zippers operate smoothly and quietly allowing you to maintain high levels of stealth necessary for a successful hunting trip. It has integrated bow/rifle carrier for convenience and simplicity of use. As with all wonderful quality hunting packs, this unit has a helpful rain cover. This pack is unusually comfortable to wear thanks to breathable back pad, ergonomic shoulder straps and supportive. With 2400 cubic inches of raw storage, you can be sure the backpack will take in all the crucial gears you need for your hunting expedition. You can hunt fast and light without missing anything. The construction material is Rubric Rip-Stop fabric that is up to 50 percent sturdier with two and a half times that tear strength of conventional fabrics. The designer added padded air-mesh to the back panel, the suspension and waist belts. Tenzing guarantees this outdoor add-on fail-proof. Unlock the warrior that you are by purchasing the WolfWarriorX Military tactical backpack. Nicely built and affordable, this pack boasts of impressive craftsmanship and top-notch materials. It is a wear and tear resistant rucksack suitable for many applications including assault, camping, hiking, fishing, trekking, hunting and bugging out. The pack is designed to withstand heavy use and provides you with 26 liters of usable storage space. It measures 16.5 inches x 11 inches x 9 inches and allows you to keep your outdoor gear with confidence knowing they are safe. WolfWarriorX military tactical pack is small and compact so that you can carry it comfortably on your shoulders for a fast and light hunt. Built to last a lifetime, this pack boasts of 600 Denier Polyester Fabric that is double stitched for durability. Zippers are durable, snag-free and operate smoothly with only little noise. It has a front and side load compression system to make organizing stuff effortless. This outdoor equipment is excellent for outdoors. It is armed with comfortable and ergonomic mesh padding on the back area and shoulder straps. You will get it a breeze to use even on long days of hunting or hiking. It is also low-profile to provide adequate camouflage. It is lightweight and water-resistant to make your outdoor exercises convenient. Are you looking for the best backcountry hunting backpack? I would recommend you check out the Killshot pack by Timer Hawk. This is a multi-day backcountry pack for hunters who are serious about their hobby. It offers you a whopping 56.2 liters of usable storage. You can carry a tripod, a rifle or a bow in many different ways. The Killshot includes a robust, ultra-quiet twill lining, a 2-liter reversible hydration bladder system and a pull-out rain cover. It offers an adjustable shoulder strap system design to afford multiple torso sizes. You will remember that many hunting packs do not allow for torso adjustment. The deluxe padded waist belt features an ergonomic tightening adjustment. These features ensure you feel comfortable at all time even with the load on your back. Killshot’s main compartment provides enough capacity to organize several nights worth of hunting gear. Top and bottom lashing points offer additional storage exterior storage space. Overall dimensions are 12.5 inches x 22 inches x 12 inches with a weight of 7.6 pounds when fully stuffed. The construction material is polyester brushed tricot with polyvinyl chloride (PVC) backing which is durable and resistant to many environmental influences. 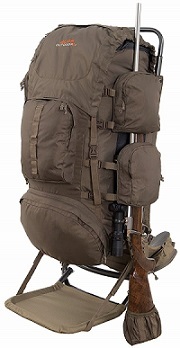 Other great features include Hawk-Eye binocular strap system, dropdown scabbard for secure and convenient rifle storage and Silent Stalk quick ejection clips that great for dropping the pack hurriedly. There is an internal spotting scope sleeve as well as a double shoulder strap compartments for phones, radios, and global positioning system. The X2 hunting pack by Eberlestock is a little compact hunting backpack that has significant pack features. It boasts of oversized compression on the front and sides for lashing on massive loads of gear and even game meat after a kill. It also has two hydration compartments and rapid-access pockets for tripods and scopes. The frame is the backbone of backpacks is the frame. If made of poor quality material, it will not withstand the weight. It should also be lightweight. Eberlestock X2 pack is fitted with a rugged intex tubular frame made from aluminum. According to tests, this backpack is beautifully capable of moving all manner of gear into a spike camp. X2 is proved to be capable of hauling loads such as elk quarter with a fast snap of four buckles. You will also like the compatibility of this backpack with Eberlestock’s ARCG ButtBucket used to hold a compound bow. Interestingly, the ButtBucket is universal for compound bows. In other words, it will keep any bow under the category of a compound crossbow. It is also engineered to accept A1SS or A2SS side scabbards, also from Eberlestock, to hold either full-scale rifle or just a shotgun. The pack has padlock webbing tie-points in prime locations for lashing gear and accessory attachment. 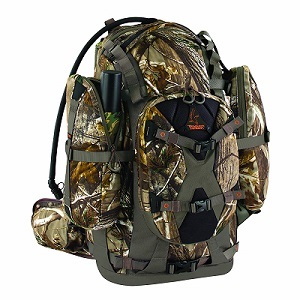 Your hunting endeavor would be guaranteed success if you were to buy the Badlands Superday Camouflage Hunting Backpack. It is one of the most used packs by hunters all over the planet. Its quality outweighs some of the most expensive models you will find in the market. This hunting BOB will carry a rifle or a bow easily and safely. It has a built-in hip-belt holster suitable for a sidearm. Its hydration system makes it capable of hauling enough quantity of water to take you through at least 72 hours of night-outs. The total volume of this pack is 32 liters or 1950 cubic inches. Like other Badland’s backpacks, Superday features the innovative molle system which is a molded so advanced ergonomically that it literally matches each contour of the human body. This means lots of comforts even if you have to hunt all day long for several days. Thus, it is ideal for archery and bow hunting, scouting and rifle-hunting. The camo pattern on Superday’s fabric is optimized for bow hunting. It consists of various micro and macro patterns help hide movement and are incredibly versatile the many hunting environment material. The ready-access waist belt pockets, as well as five external compression straps, making it a breeze to access the gear you are interested in. It is made with top-notch KXO 32 fabric. Before committing to buy the best hunting backpack, it is vital you find out you are obtaining the value for your investment. Several attributes are pointers when it comes to the quality and performance of these essential hunting companions. I intend to explore these attributes to help you have a better understanding of what makes the best backpack for hunting. Lots of gears are necessary to make a hunting trip successful. Of the most notable items are weapons for hunting which can be a firearm or a good crossbow. But you also need items such as water, radio, spotting scopes, tripods, and navigation system. Once you make a kill, your attention would be to find a way to haul it from the hunting spot. For you to carry all these items and other crucial ones, adequate storage is a must. While you must take many things, the weight of the backpack must remain within your means. So, you must make a wise decision to maximize space and reduce weight. Anyhow, the amount of usable storage space depends on the kind of hunting expedition you desire to undertake. For instance, if you will be making day trips or short hunting session, then a capacity ranging from 1500 to 2500 cubic inches would suffice. On the contrary, choose backpacks with sizes of over 2500 cubic inches if your hunting trips will be overnight or last for days. These are called multi-day packs. The type of prey you intend to hunt is also a determining factor. For example, you will need a large capacity pack to haul massive meat resulting from a large game such as an elk. It would be useless to kill only to fail to haul the meat home because of inadequate storage. A good backpack for archery or hunting should have easily accessible storage pockets and compartments fitted with features to secure the items safely in place. In other words, it should have straps, zippers, and buckles that perform optimally. Hunting involves hiking or trekking on rugged terrains. Besides, it exposes you, and your gear to outdoor elements which may sometimes be extreme. Only backpacks made high-quality materials. The material should withstand the effects of being whipped by tree limbs and branches. It should also be resistant to water, dirt, blood and excessive heat or cold. Nylon: This material is excellent for backpacks for its strength, and ability to dry rapidly following exposure to water. It also offers some protection against UV rays. Cordura Nylon: This material is used due to its lightweight and durability. The problem is that it is less resistant to water. Rip-Stop Nylon: It is similar in many ways to the traditional nylon. The only difference is its incredible durability and limited ability to rip. The latter makes it ideal for making backpacks. Polyester: This material is strong and protects against ultraviolet rays. However, it has limited strength when compared to nylon and its derivatives. Canvas: Highly durable, canvas has been used for making backpacks. Its limiting property is weight and poor water resistance. Until about decades ago, this was the favorite material for making hunting backpacks. Those four are the most typical materials. However, many brands now use synthetic materials with the commonest being leather and suede. UV rays protection could be the most critical determinant of the ability of a material to resist wear and tear. Ultraviolet rays weaken the fibers of a material when exposed making the material susceptible to ripping and tearing. You should not confuse dimensions with storage capacity. Size of a hunting backpack has very little to do with the number of items and accessories it can hold. This attribute has everything to do with how the bag will fit you. It is imperative that the pack fits you comfortably and ergonomically to minimize fatigue especially if you have to hunt for extended hours. The best model for you should fit your torso length as well as your height perfectly. A poor fit means the weight of the load you will be carrying is imbalanced and this can negatively affect your agility and speed both of which are necessary for a successful hunting trip. Some brands have managed to capture the problem faced by people who are not sure about the pack size to buy. They have included a feature that allows you to adjust the pack for your torso length. Referred to as suspension adjustment, you can buy any pack that captures your attention and worry about fit issues. There is a range of size so that you can choose what fits your stature. When I talk about color, I mean how well your backpack will camouflage with the hunting environment. Makers of these items know this well. That is why many packs are available in a range of camouflage colors. That does not mean no packs are featuring solid colors such as orange, pink, green and neutral colors. Regardless of the color you choose, what matters is that you do not stand out. You must be as stealthy as possible. Camo backpacks are great because you blend well with the vegetation and other obstacles in the woods so you can stalk your prey. Some brands go even further by treating their packs with cent diminishing substance so that the prey does not smell you coming. Nevertheless, the choice of which color to go for is a personal decision. Hip belts serve the vital purpose of transferring weight to your legs from your hips. Leg muscles are much stronger than the shoulder muscles. So shifting the pressure down there will reduce the amount of weight your shoulders have to bear. Up to 60 percent of the backpack’s weight will be transferred to your legs through the hip belt. So, it should be padded so that your heap is not strained. Your shoulders will have to bear about 40 percent of the backpack weight. With poor shoulder straps, such weight will make that part of your body sore and very uncomfortable. The straps should, therefore, be padded and adjustable to give you a snugly fit and comfort. The back is where the hunting pack will rest. If it does not have a good quality back support panel, you could feel severe discomfort. The panel should feature an ergonomic design that fits your body form. Apart from the support, the back should be lined with a mesh to offer ventilation and eliminate sweatiness. Best quality hunting backpacks feature Molle webbing on the back. This is perhaps the most breathable material. While most of the weight of a pack is transferred to the lower extremities, the sternum also has a role to play. The sternum strap is the one that travels across your chest (intersecting at the sternum) from one shoulder to another. The main aim of this strap is to stabilize the load and distribute its weight evenly to the left and right shoulders. There is no standard weight to be considered lightweight. It is subjective depending on your physical fitness and strength. Try to purchase a pack that is as light as possible to allow you to move swiftly and efficiently in the bushes while hunting. The resultant weight of the load will depend on the number of items you pack in it. The material used for making the pack also contributes to the overall weight. To be safe, you may want to test the kit before you take it home. Compression straps stabilize the load making it easier and comfortable to haul. A solid and compact pack is easier to move with within the woods because tree limbs and branches cannot destabilize it. You can strategize well for a hunt, but all your efforts for a kill can go off the windows by the sound of your pack. Noise will not help since you must remain concealed from the game you are hunting. Wild animals are susceptible to any sounds. So, a noisy pack will simply startle them. In no time, you will lose the advantage for a successful hunting trip because the animal will scamper to safety. Certain materials will produce noise when the backpack rubs against objects or touched. Certain types of zippers are also noisy. High-quality brands use materials that are quiet and zippers that are supers smooth to operate. Hunting often involves a lot of trekking and hiking sometimes in scorching temperatures. It is vital you haul water along with your other gears. Luckily, serious brands now make backpacks with hydration system compatibility. The system consists of pockets and ports designed to carry a hydration bladder. The great thing about packs with compatibility with hydration systems is that you enjoy hands-free drinking. You won’t have to carry some water bottle or another container. If the water in the hydration bladder is depleted, you just remove the bladder for refilling. Protection for your delicate gear is among the most crucial functions of a backpack. When choosing the right model to buy, you have to see to it that it is capable of protecting gears like binoculars, radios, a navigation system, phone and many more. Manufacturers usually promote their products by terming them waterproof. But, it is impossible for any backpack material to be completely waterproof. Most of the ones advertised as waterproof are water repelling or water resisting. The level at which a material repels or resists water is what makes it waterproof. Another gear protection feature to look for is a built-in rain cover. Choose a hunting pack that suits your needs. Three types are available depending on your needs. These include daypacks, multi-day packs and hunting fanny pack. Discussing each type is beyond the scope of this resource. Find out before you make your choice. it would not make economic sense to buy something more expensive than what you budgeted for even if the money you have can pay the price. So, look for a backpack that falls within your budget. Keep in mind that you only get what you pay for. The weight of your pack when fully stuffed should not exceed what you can comfortably carry. For instance, a 60-liter backpack may be too heavy for a petite person measuring just over 100 pounds. Your fitness level also matters. Hunting bags range in size from 1500 cubic inches to 5000 cubic inches. Choose what suits your needs. Your convenience is more important than anything else. Best quality packs come with hip-belt straps, shoulder straps and sternum straps that are padded for comfort. The straps should be easy to modify for a snugly and comfortable fit. Look for a product that grants access to the hydration system effortlessly. Check if it has water bottle pockets or hydration bladder pockets and their position on the pack. You have the opportunity to choose between framed and frameless hunting packs. Framed hunting packs are more stable and more durable than the frameless ones. The great thing about the frameless backpacks is their ability to be extremely lightweight. You must carry a hunting weapon on a hunting trip. Look for a pack that offers you a safe and convenient carriage for your crossbow or rifle. You cannot be sure of what the climatic conditions will be when you are out hunting. That’s why you should buy daypack or multi-pack that is made of waterproof material and has a built-in rain cover. How to Pack your Hunting Backpack! I hope you realize the many options at your disposal when you are looking for the best hunting backpack. I’m sure this review has given you enough insight to enable you to embark on a serious shopping expedition. Each of the backpacks in this review has a unique feature that sets it apart from its competitors. The best way to get what you want is to identify the feature that you love most in these products and then see if you can afford it. Verified customer reviews on online retail platforms offer exception help when it comes to decision making. Once you shortlist the models that capture your attention, check their description available on the retail websites and then read the user comments. Luckily for you, I have researched on your behalf, and you can trust my options. All you are left with is to click on the provided link, and you will see just how great these products are for a day or multi-day hunting. I wish you the best of best of luck in trying to find the best backpack for hunting.